It has been a long time since I have posted my random thoughts, so I have quite a bit to share with you. In case you have forgotten or you are a new reader to my blog (welcome! ), my comments are in no particular order. They are just as random as this blog post. Have you seen the video clip of the 4 year-old girl in Ohio that was blown off her feet by strong winds as she opened the door to her home? Within seconds she and the door were blown out of sight. She didn’t even drop her cellphone. Incredible! I attended public schools and my children are in the public school system. I had Pell grants and I have student loans. That makes me overqualified for Education Secretary. It was suggested that I could be Surgeon General but apparently I am overqualified for that position as well. Ah forget it, I give up. Ben Carson is Secretary of Housing and Urban Development (HUD). I recall him saying he wasn’t qualified for the position because he wasn’t experienced in running a federal agency. Really? But you ran for President of the United States. I don’t know who knows the less between him and Donald Trump. Speaking of Ben Carson, I want to call him a term that is two words and begins with the letter ‘h’ so bad, but since I don’t talk that way I’ll just keep that thought to myself. I have no idea what the picture below is about but I can’t go into the store and ask anyone because I think it’s permanently closed. 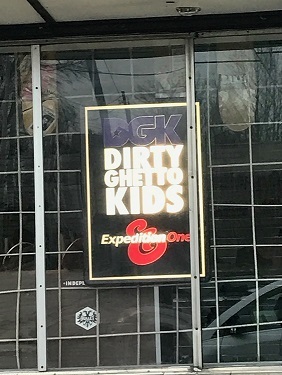 There are several signs in the window, no one is ever there, and it’s always dark. They can’t find the missing Tennessee teenage girl and her former teacher, but they found Tom Brady’s jersey IN ANOTHER COUNTRY. 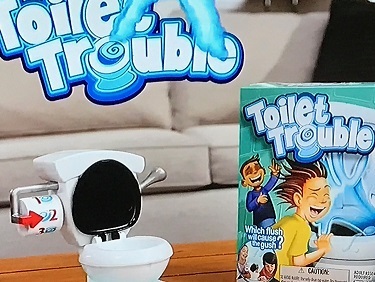 There is a game called Toilet Trouble that is so nasty to me. You hold your face over the toilet, flush, and get sprayed by water. I get mad whenever the commercial comes on TV and my kids laugh at me. Speaking of getting mad, as much as I love WWE (World Wrestling Entertainment), I cannot stand their New Day Gimmick. I like Big E. Langston, Kofi Kingston, and Xavier Woods as wrestlers, but I can’t stand them as New Day. They frolic around the ring gyrating while Xavier plays the trombone. One day Kofi twerked so fast and hard I was sure his backside would fall off. I mean, he literally dropped it like it was hot. That’s for me, a female, to do. I am a black female so I especially don’t like seeing brothers behave in that fashion. I know it’s scripted but come on, that pink wearing, unicorn horns on their heads has gone on long enough. I received a text one night while I was at work that Big E. spanked the Miz. I was like, “What the f**k?” Such a waste of talent. Buffoonery at its finest. 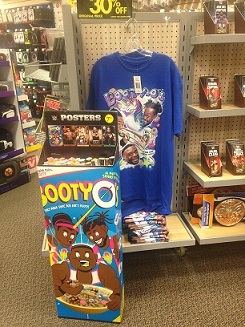 I won’t post a picture of them but here’s merchandise I saw at the store. 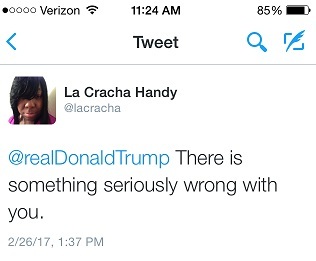 I follow Donald Trump on Twitter and I even comment on his ridiculous tweets at times. My comments get deleted, probably because I’m not a celebrity or reporter with thousands of followers. But that’s okay, I like being an unknown. 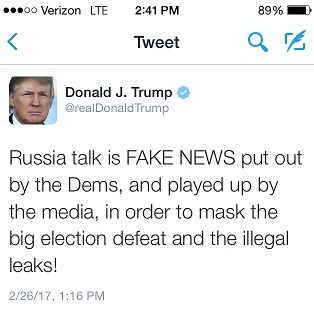 Here is one of his silly tweets. I don’t care what anyone says, the Democrats and Republicans WORKED TOGETHER to block Donald Trump’s monstrosity health care plan. It may have been unknowing to them but they worked together. Now all they have to do is knowingly work together and deem that mental case unfit as President of the United States. Despite the water crisis in the city of Flint, Michigan, great things have, and still are, happening in the city and the surrounding areas. 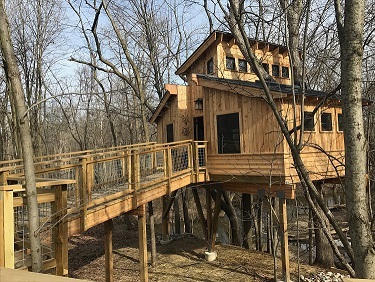 Last summer, Treehouse Masters, the television reality show on Animal Planet, built a treehouse at For-Mar Nature Preserve & Arboretum in Burton, Michigan. Burton is located just outside the city of Flint. There was an unusually warm day last month so my kids and I went to see the treehouse and to take a walk on a couple of nature trails. That treehouse is BEAUTIFUL inside and out! I watched the episode on Treehouse Masters and it was a tear-jerker. Pete Nelson and his crew did an amazing job. For-Mar has superheroes and the staff made Pete a superhero! 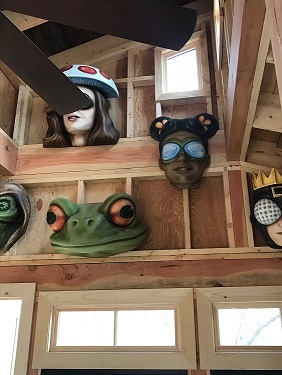 The picture immediately above was taken inside the treehouse. Pictured are a few of For-Mar’s superheroes. Hurley Medical Center, a level I trauma center located in the city of Flint, Michigan is also a Children’s Miracle Network (CMN) hospital. 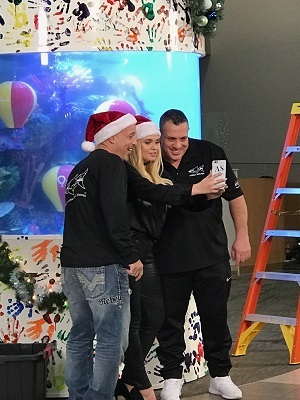 Back in the fall Alli Simpson, a celebrity who helps raise awareness for CMN hospitals, selected Hurley to receive an aquarium for its’ children’s hospital. 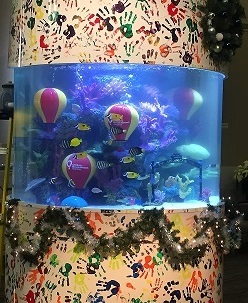 Thanks to Alli and Animal Planet’s Tanked, a 900 gallon aquarium was installed at Hurley’s Children Hospital. 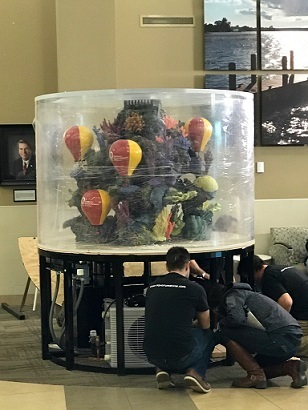 I work at Hurley Medical Center and I was there for the unveiling of the aquarium. I didn’t even try to control my tears. We had to keep it a secret until the week it aired on television. I am thankful beyond words for what Pete Nelson and his crew at Treehouse Masters, Alli Simpson, the crew at Tanked, and Animal Planet for what they have brought to our community. What a blessing they are. Speaking of Michigan, I live in the only state where you can show people where you live at on your hand. My kids are left-handed and I am ambidextrous. Those are my random thoughts for now. I could go on but I am getting sleepy. Feel free to add your own random thoughts or comments below and thank you for visiting my blog!